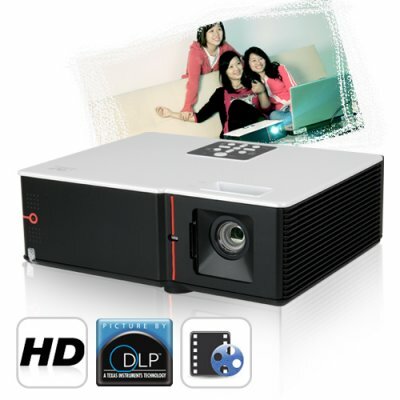 Successfully Added Theatre Maximus - DLP Projector w/ Brilliant Color Technology to your Shopping Cart. DLP Projector with advanced Texas Instruments "Brilliant Color Technology" to ensure consistent color brightness with true color accuracy along with an amazing 2000:1 contrast ratio to deliver deep colors, sharp image quality, and a vivid projection size of up to 150 inches. The CVMQ-E57 is great for watching movies, playing video games, surfing the net, or making presentations. In addition to the improved brightness achieved through Brilliant Color Technology, the Theatre Maximus DLP Projector supports true High Definition quality up to 1080i HD and is equipped with 2 VGA Ports, S-Video, RCA video, Audio Jack, USB 2.0, VGA Out and an RS232 Port, giving you maximum flexibility in your preferred mode of connectivity. If you are searching for the best value for money projector without sacrificing on quality and performance, then the Theatre Maximus DLP Projector with Brilliant Color Technology is exactly what you need! The Brilliant Color Technology simply increases the projector brightness as well as enhancements to color performance, giving you the best there is in digital image projection quality the world has to offer. This DLP projector boasts a 1024 x 786 XGA native resolution with 16:9 widescreen or traditional 4:3 projection. With ease and comfort, achieve a whopping projection size of 150 inches or larger at setbacks of up to 10 meters, and witness for yourself the pure elegance and brilliant quality this DLP projector offers. The E57 DLP Projector is perfect for home or business use and provides the multi-color processing power to enhance and increase the color performance of movies, gaming, and computer presentations. The Theatre Maximus is ultra quiet and comes with a remote controller that includes a built in laser pointer to help with your presentations. This DLP projector delivers astounding, true-to-life color from any source, both home cinema and commercial users alike will benefit from the exciting new capabilities available from DLP projection technology. This OEM projector is brought to you by Chinavasion at an astonishing low wholesale factory direct price. Click "Add to Cart" now and we'll express ship you a sample to enjoy it for yourself. Then when you see how astonishing the quality is, feature it on your online store for some easy and high profit sales for your website. What is Brilliant Color Technology? DLP Projectors with Brilliant Color technology feature multi-color processing to produce stunning, vibrant colors on the screen. Unlike other technologies such as LCD which use just 3 primary colors to produce the image, DLP Technology with Brilliant Color uses up to six separate colors. What does DLP stand for? And why is it so good? DLP stand for Digital Light Processing. It is the current leading market share processor chip from Texas Instruments that produces outstanding image projection unlike any other projector. on 2010-02-06 11:53:21 Good buy. Bought many things from Chinavasion and they all work grat, but i was a bit sceptical for the projector cause of its price, did a bit research and i found one here in my country not nearly as good and three times the price. So i descited to order the Maximus, it's a whole new experience!!Brilliant. Thank you for everything!